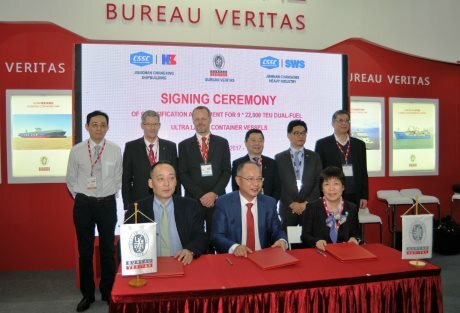 China State Shipbuilding Corporation (CSSC) shipyards Jiangnan Changxing Shipbuilding Co., Ltd. (Hudong Zhonghua) and Shanghai Jiangnan Changxing Heavy Industry Co., Ltd (SWS) sign contract with Bureau Veritas senior management in presence of CMA CGM. All nine gas-fueled Ultra Large Containerships will be built to BV class rules and under BV newbuilding supervision. Paris-La Défense, France, December 05, 2017, – The classification contract for CMA CGM’s breakthrough order for nine 22,000 TEU containerships was signed today by the two shipyards that will be building the nine ships – the world’s largest LNG fueled containerships. The ceremony was held at Marintec 2017 in Shanghai. Present to witness the contract signing at Marintec were President Chen Jun from Hudong-Zhonghua and Chairman Mr.Wang Qi from SWS together with Mr. Claude Maillot, Bureau Veritas, Senior Vice- President, Marine & Offshore, North Asia and China. Mr. Ludovic Gerard, Executive Vice-President of CMA CGM Group company, CMA Ships, introduced the ceremony emphasising the strength of the relationship between CMA CGM and Bureau Veritas.